Above: A publicity portrait of Charles Quigley from the 1944 Paramount film Duffy’s Tavern. Serial historian Alan G. Barbour once dubbed Charles Quigley an “ideal type for a serial hero,” and most cliffhanger fans, myself included, have agreed with this judgment. His heroic characterizations combined energy and enthusiasm with a definite air of shrewdness; his characters came off as both intrepid and intelligent. He could also handle humorous dialogue with real flair, bringing an amusingly wry delivery to standard heroic one-liners. Oddly enough, Quigley’s skills were infrequently utilized by cliffhanger producers. He starred in only three serials, but brought a high level of talent to each. Charles Quigley was born in New Britain, Connecticut. He developed an interest in acting at a young age, and attended the American Academy of Dramatic Arts in New York City after graduating from high school; by 1927, he was appearing on Broadway, usually in juvenile roles. For a time he was a regular member of producer/actor/manager/director Walter Hampden’s Broadway acting company–playing Christian de Neuvillette to Hampden’s Cyrano in Hampden’s 1928 production of Cyrano de Bergerac, and taking other prominent secondary roles. He made a few ventures into movie work in the early 1930s, but didn’t definitively abandon Broadway for Hollywood until 1936. After appearing in a few films for Fox and Paramount in that year, Quigley signed a contract with Columbia Pictures; his first assignment there was the hero’s role in the 1936 crime drama Lady From Nowhere, a B-film vehicle for Mary Astor. Lady inaugurated a lengthy string of Columbia B-pictures for Quigley; he starred in multiple low-budget comedies, dramas, and mysteries at that studio over the next four years–frequently working with another young Columbia contract player, Rita Cansino (later and better known as Rita Hayworth). However, he failed to rise above B-actor status–perhaps in part due to his lukewarm attitude towards movie-making in general; as his son recollects (see the Acknowledgements), Quigley considered himself primarily a stage actor, and regularly journeyed back to the East Coast to work with New England summer-stock companies during most of his years in Hollywood. Quigley left Columbia in 1939 and began to freelance as a supporting player and occasional star in B-films–and movie serials–for various studios; the first of the aforesaid serials was Daredevils of the Red Circle, one of Republic Pictures’ finest chapterplays. Daredevils starred Quigley as Gene Townley, leader of the titular trio of carnival acrobats (the other two being played by Herman Brix and David Sharpe). The three acrobatic “Daredevils” became entangled in the schemes of “39-0-13,” a villain who was conducting a campaign to destroy the business empire of Horace Granville, the man who sent him to prison. While the Daredevils were performing at a Granville-owned amusement pier, a fire set by 39-0-13’s men claimed the life of Townley’s kid brother Sammy. The trio then turned their athletic skills to crime-fighting purposes, aiding Granville (Miles Mander) and his granddaughter Blanche (Carole Landis) in a campaign against the destructive schemes of 39-0-13 (Charles Middleton), and receiving aid of their own along the way from a mysterious figure called the “Red Circle.” Daredevils was a standout among Republic’s serials not only for its inventive action scenes, but for its distinctive and likable heroes–Brix, Sharpe, and, of course, Quigley, who handled each aspect of his role with skill, whether he was bantering cheerfully with his fellow Daredevils, displaying moving grief at his brother’s death, or leaping into fights and chases with abandon. Above: Charles Quigley (right) grapples with Bert LeBaron atop a gasoline storage tank in Daredevils of the Red Circle (Republic, 1939). 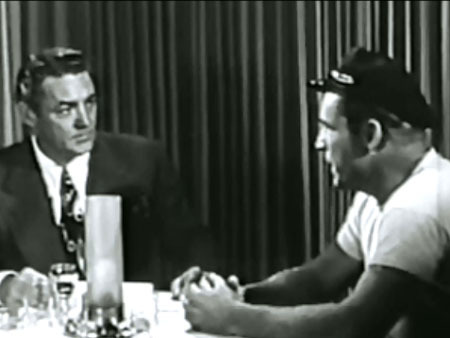 Above, from left to right: Charles Quigley, David Sharpe, and Herman Brix examine a mysterious clue at the breakfast table while puzzled butler Fred “Snowflake” Toones looks on in Daredevils of the Red Circle. Quigley played bit roles in various films for the next two year, temporarily returning to Columbia Pictures to star in their 1941 serial, The Iron Claw. He played a newspaper reporter named Bob Lane and battled a mysterious criminal known as the Iron Claw, who was vying with numerous members of the greedy Benson family in a search for hidden gold. This cliffhanger, with former comedy director James W. Horne behind the camera, emerged as an out-and-out serial spoof, with a group of clumsy gangsters, the hysterically paranoid Benson patriarch (Forest Taylor), and the visually menacing but incompetent Iron Claw himself contributing more laughs than chills. While not a typical serial, The Iron Claw was a highly entertaining one, and Quigley’s flair for humor fit the serial’s slapstick tone nicely. He played his character as something of a parody of his usual screen characterizations, making him breezy, frantically energetic, and self-assured to the point of recklessness; he also engaged in many amusing comedic interchanges with his sidekick Walter Sande. Above: Charles Quigley and Walter Sande in a shadowy scene from The Iron Claw (Columbia, 1941). Above: Quigley and Sande slug it out with the Claw’s henchmen in a posed scene from The Iron Claw. Upon the outbreak of World War 2, Quigley went to work for the Northrop Corporation, a leading manufacturer of military aircraft. This defense-plant job curtailed his movie career almost entirely until 1946; he only made about half-a-dozen movies during the war years, and devoted most of his spare time to appearances in impromptu stage plays. His film appearances became only slightly less sporadic after the war ended; during the later years of the 1940s, he spent more time running a Connecticut summer theatre of his own–the Clinton Playhouse—than he did working before movie cameras; he also worked in live television during that medium’s early post-war developmental years. Quigley’s most notable big-screen vehicle in the post-war era was his third and last starring serial, Republic’s The Crimson Ghost. He was cast as Duncan Richards, a scientist and criminologist attempting to protect the “Cyclotrode,” a counter-atomic weapon, from a masked master criminal called The Crimson Ghost. Quigley’s air of intelligence helped him to be convincing as a brilliant scientist, and his wry delivery helped him to make some of his character’s entertaining quips quite memorable, especially the line, “that stopped it, my ghostly friend,” uttered after his character knocks out a machine just declared unstoppable by the Crimson Ghost. The Crimson Ghost benefited not only from Quigley’s performance, but from a strong supporting cast, memorable cliffhangers, and furious action. It was possibly the best-remembered of all Republic’s post-war serials, and made a worthy conclusion to Quigley’s brief career as a serial star. Above: Charles Quigley holds villain Clayton Moore at gunpoint, unaware that the mind-controlled Linda Stirling is about to attack him in The Crimson Ghost (Republic, 1946). Above: Charles Quigley and leading lady Linda Stirling are threatened by The Crimson Ghost in this publicity still. The Crimson Ghost was Quigley’s last starring serial, but not his final serial. 1948 found him appearing as the chief villain in the Columbia serial Brick Bradford; his character, Dr. Laydron, was continually scheming to get his hands on an “Interceptor Ray” developed by scientist John Merton. Quigley was opposed and finally (in the last chapter) sent hurtling off a cliff by Kane Richmond as hero Brick Bradford. Bradford possessed a low budget that made its science-fictional trappings unimpressive, and was further damaged by an uneven script that constantly shifted the serial’s tone from straight-faced to self-parodying. However, Quigley made a suave and interesting villain, and easily handled the serial’s shifts in tone–utilizing the shrewd aspect of his screen persona to make Dr. Laydron seem inventive and cunning, and using his humorous talents to give the bad doctor an amusingly smug and sarcastic edge. Above: Charles Quigley, kneeling, prepares a death ray to kill the helpless Pierre Watkin and Linda Johnson. Fred Graham (in dark suit) and Jack Ingram assist Quigley in Brick Bradford (Columbia, 1948). Above: A smirking Charles Quigley trades verbal barbs with the off-camera Carol Forman as Terry Frost looks on in Superman (Columbia, 1948). After Superman, Quigley only made four more films before dropping out of the movie business almost completely; the last of these films was his final serial, Pirates of the High Seas (Columbia, 1950). He appeared in one brief scene as a sly shyster named Merkel, who tried to cheat sea captain hero Buster Crabbe in the first chapter and departed the serial after being thwarted. Above: Charles Quigley and Buster Crabbe in Pirates of the High Seas (Columbia, 1950). Quigley remained almost exclusively a stage actor during the 1950s, only venturing back before the camera for a few TV appearances on shows like Maverick and Casey Jones during the decade’s later years, and for one final movie–the 1959 Allied Artists drama Tokyo After Dark, in which he had an uncredited part as a general. He passed away in Los Angeles five years after this last picture was released. Charles Quigley was unfortunately underused by serial producers throughout his career; many cliffhangers that suffered from listless leading men could have benefited by recasting him in the lead. However, his serial filmography was remarkable for quality if not for quantity; The Crimson Ghost and Daredevils of the Red Circle rank among Republic Pictures’ best, while The Iron Claw was the most enjoyable of all James W. Horne’s attempts at serial parody. Charles Quigley played an important role in the success of each of these serials, and easily earned a place among the best cliffhanger heroes. 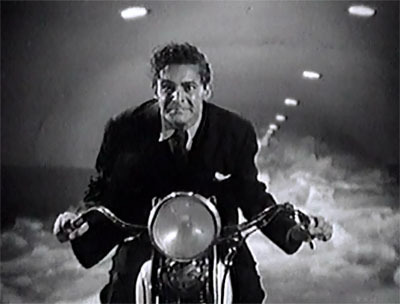 Above: Charles Quigley grimly races to escape roaring flood waters in an undersea tunnel in a famous scene from Daredevils of the Red Circle (Republic, 1939). Acknowledgements: My sincere thanks to Charles Quigley’s son Charles N. Quigley, who kindly provided me with biographical information on his father and helped me to improve and expand this article. His in-depth reminiscences of his dad’s acting career can be found on this page, reproduced through his gracious permission.